1,3,5,7-Cyclooctatetraene (COT) is an unsaturated derivative of cyclooctane, with the formula C8H8. It is also known as annulene. This polyunsaturated hydrocarbon is a colorless to light yellow flammable liquid at room temperature. 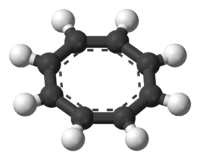 Because of its stoichiometric relationship to benzene, COT has been the subject of much research and some controversy. 8 (cyclooctatetraenide), is. Its reactivity is characteristic of an ordinary polyene, i.e. it undergoes addition reactions. Benzene, by contrast, characteristically undergoes substitution reactions, not additions. Willstätter noted that the compound did not exhibit the expected aromaticity. Between 1939 and 1943, chemists throughout the US unsuccessfully attempted to synthesize COT. They rationalized their lack of success with the conclusion that Willstätter had not actually synthesized the compound but instead its isomer, styrene. Willstätter responded to these reviews in his autobiography, where he noted that the American chemists were 'untroubled' by the reduction of his cyclooctatetraene to cyclooctane (a reaction impossible for styrene). During World War 2, Walter Reppe at BASF Ludwigshafen developed a simple, one-step synthesis of cyclooctatetraene from acetylene, providing material identical to that prepared by Willstätter. Any remaining doubts on the accuracy of Willstätter's original synthesis were resolved when Arthur C. Cope and co-workers at MIT reported, in 1947, a complete repetition of the Willstätter synthesis, step by step, using the originally reported techniques. They obtained the same cyclooctatetraene, and they subsequently reported modern spectral characterization of many of the intermediate products, again confirming the accuracy of Willstätter's original work. Cyclooctatetraene in its native "tub-shaped" conformation. Early studies demonstrated that COT did not display the chemistry of an aromatic compound. Then, early electron diffraction experiments concluded that the C-C bond distances were identical. However, X-ray diffraction data from H. S. Kaufman demonstrated cyclooctatetraene to adopt several conformations and to contain two distinct C–C bond distances. This result indicated that COT is an annulene with fixed alternating single and double C-C bonds. In its normal state, cyclooctatetraene is non-planar and adopts a tub conformation with angles C=C−C = 126.1° and C=C−H = 117.6°. The point group of cyclooctatetraene is D2d. In its planar transition state, D4h transitional state is more stable than D8h transitional state due to Jahn–Teller effect. COT can also be prepared by photolysis of barrelene, one of its structural isomers, the reaction proceeding via another isolable isomer, semibullvalene. COT derivatives can also be synthesised by way of semibullvalene intermediates. In the sequence illustrated below, octaethylcyclooctatetraene (C8Et8) is formed by thermal isomerisation of octaethylsemibullvalene, itself formed by copper(I) bromide mediated cyclodimerisation of 1,2,3,4-tetraethyl-1,4-dilithio-1,3-butadiene. Because COT is unstable and easily forms explosive organic peroxides, a small amount of hydroquinone is usually added to commercially available material. Testing for peroxides is advised when using a previously opened bottle; white crystals around the neck of the bottle may be composed of the peroxide, which may explode when mechanically disturbed. Cyclooctatetraene has been isolated from certain fungi. The π bonds in COT react as usual for olefins, rather than as aromatic ring systems. Mono- and polyepoxides can be generated by reaction of COT with peroxy acids or with dimethyldioxirane. Various other addition reactions are also known. Furthermore, polyacetylene can be synthesized via the ring-opening polymerization of cyclooctatetraene. COT itself—and also analogs with side-chains—have been used as metal ligands and in sandwich compounds. 8. The dianion is both planar and octagonal in shape and aromatic with a Hückel electron count of 10. Cyclooctatetraene forms organometallic complexes with some metals, including yttrium and lanthanides. One-dimensional Eu–COT sandwiches have been described as nanowires. The sandwich compounds U(COT)2 (uranocene), and Fe(COT)2, are known. Uranocene, a sandwich compound containing two COT2− rings. The compound Fe(COT)2, when refluxed in toluene with dimethyl sulfoxide and dimethoxyethane for 5 days, is found to form magnetite and crystalline carbon also containing carbon nanotubes. Because COT changes conformation between tub-shaped and planar with addition or subtraction of electrons, it could, in principle, be used to construct artificial muscles. Such devices have been contemplated to be makeable by grafting COT derivatives to a backbone of a suitable conducting polymer, which would supply or remove the reducing equivalents. ↑ Nomenclature of Organic Chemistry : IUPAC Recommendations and Preferred Names 2013 (Blue Book). Cambridge: The Royal Society of Chemistry. 2014. pp. 22, 1160. doi:10.1039/9781849733069-FP001. ISBN 978-0-85404-182-4. ↑ Mason, S. (February 1997). "The Science and Humanism of Linus Pauling (1901−1994)". Chem. Soc. Rev. 26: 29–39. doi:10.1039/CS9972600029. ↑ Willstätter, Richard; Waser, Ernst (1911). "Über Cyclo-octatetraen" [On cyclooctatetraene]. Ber. Dtsch. Chem. Ges. 44 (3): 3423–3445. doi:10.1002/cber.191104403216. 1 2 Reppe, Walter; Schlichting, Otto; Klager, Karl; Toepel, Tim (1948). "Cyclisierende Polymerisation von Acetylen. I. Über Cyclooctatetraen" [Ring-forming polymerization of acetylene. I. Cyclooctatetraene]. Liebigs Ann. Chem. 560 (1): 1–92. doi:10.1002/jlac.19485600102. ↑ Cope, Arthur C.; Overberger, C. G. (1947). "The synthesis of cycloöctatetraene from pseudopelletierine". J. Am. Chem. Soc. 69 (4): 976. doi:10.1021/ja01196a513. ↑ Cope, Arthur C.; Overberger, C. G. (1947). "Cyclic Polyolefins. I. Synthesis of Cycloöctatetraene from Pseudopelletierine". J. Am. Chem. Soc. 70 (4): 1433–1437. doi:10.1021/ja01184a041. ↑ Johnson, A. W. (1947). "Organic Chemistry". Sci. Progr. 35: 506. JSTOR 43413011. ↑ Bastiensen, O.; Hassel, O.; Langseth, A. (1947). 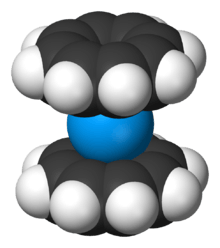 "The 'Octa-Benzene', Cyclo-octatetraene (C8H8)" (PDF). Nature. 160 (4056): 128. Bibcode:1947Natur.160..128B. doi:10.1038/160128a0. ↑ Kaufman, H. S.; Fankuchen, I.; H., Mark (1948). "Structure of Cyclo-octatetraene" (PDF). Nature. 161 (4083): 165. Bibcode:1948Natur.161..165K. doi:10.1038/161165a0. ↑ Thomas, P. M.; Weber, A. (1978). "High resolution Raman spectroscopy of gases with laser sources. XIII – the pure rotational spectra of 1,3,5,7-cyclooctatetraene and 1,5-cyclooctadiene". J. Raman Spectr. 7 (6): 353–357. Bibcode:1978JRSp....7..353T. doi:10.1002/jrs.1250070614. ↑ Claus, K. H.; Krüger, C. (15 September 1988). "Structure of cyclooctatetraene at 129 K". Acta Crystallogr. C. 44 (9): 1632–1634. doi:10.1107/S0108270188005840. ↑ Nishinaga, Tohru; Ohmae, Takeshi; Iyoda, Masahiko (5 February 2010). "Recent Studies on the Aromaticity and Antiaromaticity of Planar Cyclooctatetraene". Aromaticity and Molecular Symmetry. 2 (1): 76–97. doi:10.3390/sym2010076. ↑ Zimmerman, H. E.; Grunewald, G. L. (1966). "The Chemistry of Barrelene. III. A Unique Photoisomerization to Semibullvalene" (PDF). J. Am. Chem. Soc. 88 (1): 183–184. doi:10.1021/ja00953a045. ↑ Wang, C.; Yuan, J.; Li, G.; Wang, Z.; Zhang, S.; Xi, Z. (2006). "Metal-Mediated Efficient Synthesis, Structural Characterization, and Skeletal Rearrangement of Octasubstituted Semibullvalenes". J. Am. Chem. Soc. 128 (14): 4564–4565. doi:10.1021/ja0579208. PMID 16594680. ↑ Stinson, M.; Ezra, D.; Hess, W. M.; Sears, J.; Strobel, G. (2003). "An endophytic Gliocladium sp. of Eucryphia cordifolia producing selective volatile antimicrobial compounds". Plant Sci. 165: 913–922. doi:10.1016/S0168-9452(03)00299-1. ↑ Moorhead, Eric J.; Wenzel, Anna G. (August 2009). "Two Undergraduate Experiments in Organic Polymers: The Preparation of Polyacetylene and Telechelic Polyacetylene via Ring-Opening Metathesis Polymerization". J. Chem. Educ. 86 (8): 973. doi:10.1021/ed086p973. ↑ Katz, Thomas J. (1960). "The cyclooctatetraenyl dianion". J. Am. Chem. Soc. 82 (14): 3784–3785. doi:10.1021/ja01499a077. ↑ Walter, Erich C.; Beetz, Tobias; Sfeir, Matthew Y.; Brus, Louis E.; Steigerwald, Michael L. (2006). "Crystalline Graphite from an Organometallic Solution-Phase Reaction". J. Am. Chem. Soc. 128 (49): 15590–15591. doi:10.1021/ja0666203.